Corzetti pasta Liguria with pesto, potatoes and green beans. Pasta alla ligure con patate e fagiolini. In the same way that Bolognese sauce is omnipresent in Bologna’s homes and restaurants, basil pesto or pesto Genovese is ubiquitous in Ligurian cuisine. In fact, it’s practically a national symbol in Liguria, the Northern Italian region it comes from. People in Liguria are not only very proud of their pesto, but also quite fanatic about how it should be made and how to serve it. This pesto pasta Liguria with potatoes and green beans recipe is one of the most traditional ways they eat pesto in Liguria. 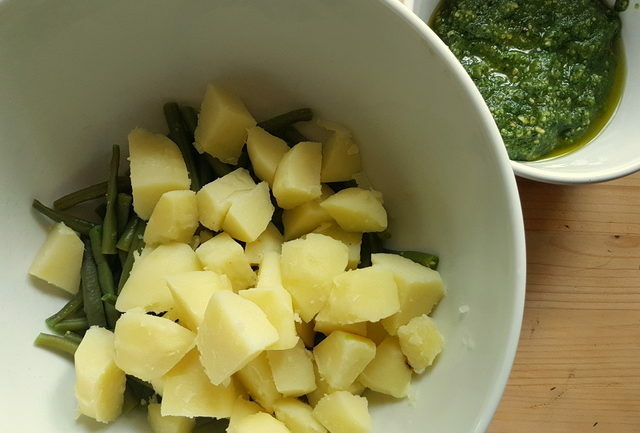 The pesto, which is always homemade, is served with green beans, potatoes and pasta. The official basil pesto recipe. 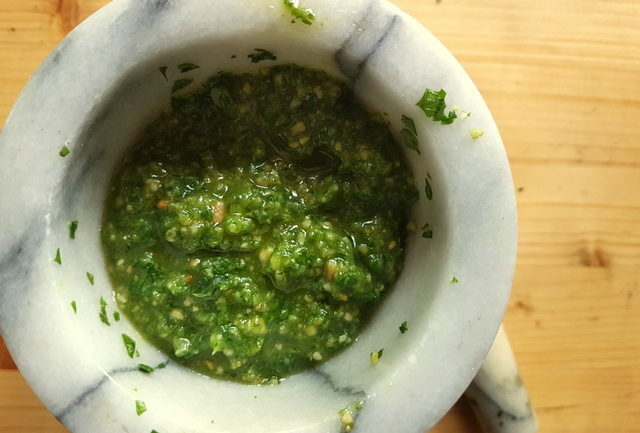 Also like Bolognese in Bologna, basil pesto has an official recipe! This was published by the Genoa Chamber of Commerce and is composed of 7 ingredients; Ligurian basil leaves, Mediterranean pine-nuts, Vessalico garlic cloves, Ligurian extra virgin olive oil, coarse sea salt and two types of cheese, aged Parmesan and Pecorino from Sardinia. Of course, most of us have to use locally sourced ingredients such as basil leaves garlic and olive oil. It may also not be possible to find both cheeses. 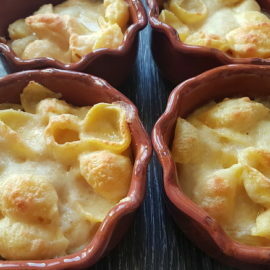 I actually often make it with just Parmesan (but don’t tell anyone from Genoa!). Pesto Pasta Liguria with potatoes and green beans. Pasta with pesto can be found in every restaurant in Liguria. 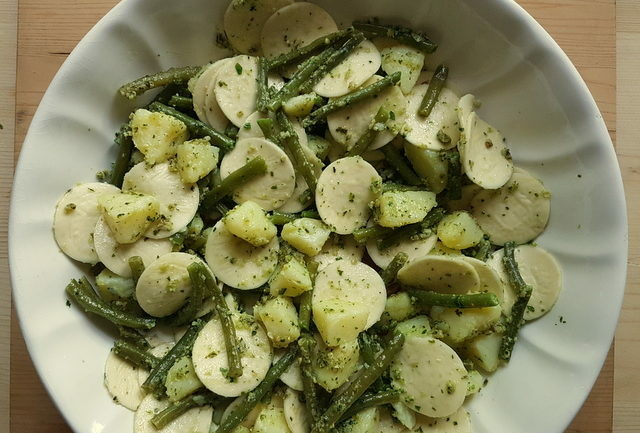 The pasta is usually trenette (similar to linguine), trofie or corzetti and is dressed with just pesto and grated cheese or, as in this recipe, with potatoes and green beans as well. Normally just called pesto pasta Liguria with potatoes and green beans (pasta alla ligure con patate e fagiolini) , this dish is also known as pesto avvantaggiato. Most often the pasta, potatoes and beans are cooked in the same pot, sometimes one ingredient at a time, but also all together. Then everything is tossed with basil pesto. 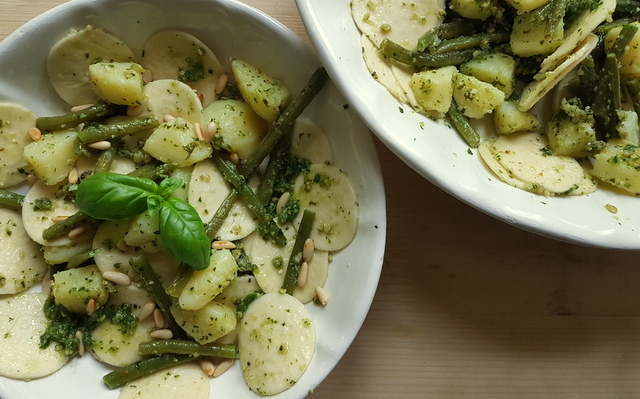 This pesto pasta Liguria with potatoes and green beans is a very easy dish to make as you only need one cooking pot and the pesto is, of course, made from raw ingredients. Some people recommend salting the cooking water quite heavily. This is because the salt is said to help maintain the bright colour of the beans and keep the potatoes firm! 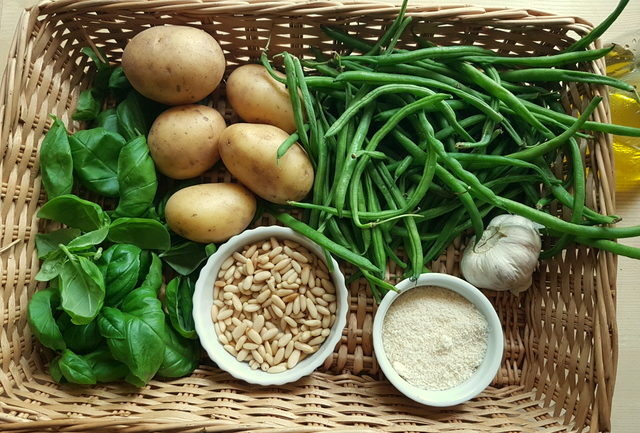 Whether you cook the pasta, potatoes and green beans together depends on individual choice. However, if using fresh pasta, this definitely needs to be cooked alone or added only 2-3 minutes before the beans and potatoes are ready. I cooked the vegetables and pasta separately, but in the same water, as I find it’s easier to get the cooking times right. 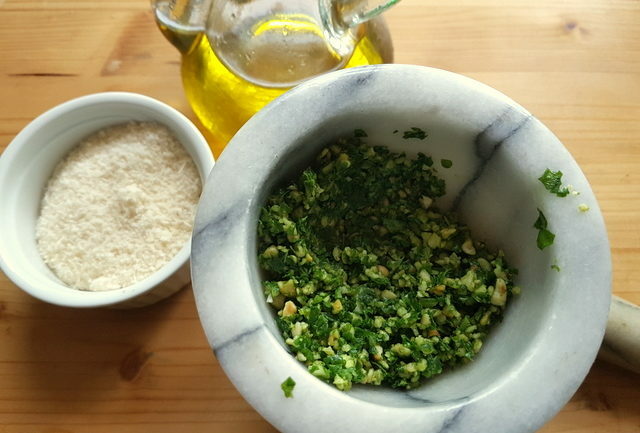 Traditionally basil pesto is made with a pestle and mortar. However, you can also use a blender or mini food processor. Alternatively, crush the pine nuts with a pestle and mortar or a hammer and use a blender for the rest. But, mix the cheese in after with a fork or wooden spoon. This gives the pesto a more authentic texture. I used corzetti pasta medallions for this pesto pasta Liguria recipe. 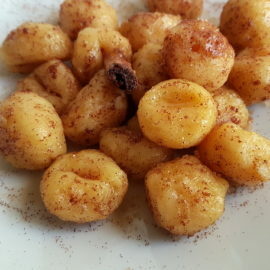 Corzetti, also called croxetti, are an ancient type of pasta dating back to the Middle Ages. The designs on the pasta are created with a wooden mold or stamp. This stamp has two designs engraved on it (one for each face of the pasta medallion). In the past, noble families had their family coat of arms engraved into the stamp! You can read more about this unique pasta on my corzetti or croxetti post. 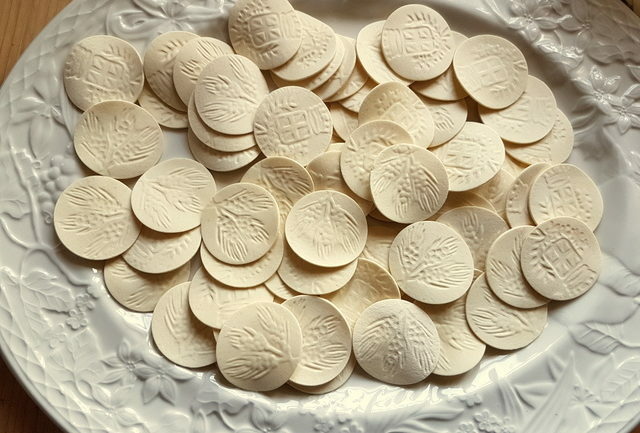 You can buy dried corzetti or make them yourself (I used dried).There are companies which sell these stamps online such as this company called Florentine Touch . They sell corzetti stamps through Etsy. You can even order your own design! If you can’t find corzetti, trofie or linguine are traditional pasta partners for basil pesto with potatoes and green beans. Alternatively fettuccine or penne work well too. Whichever pasta you use, I’m sure you’ll love this typical Ligurian way to eat pasta with pesto. 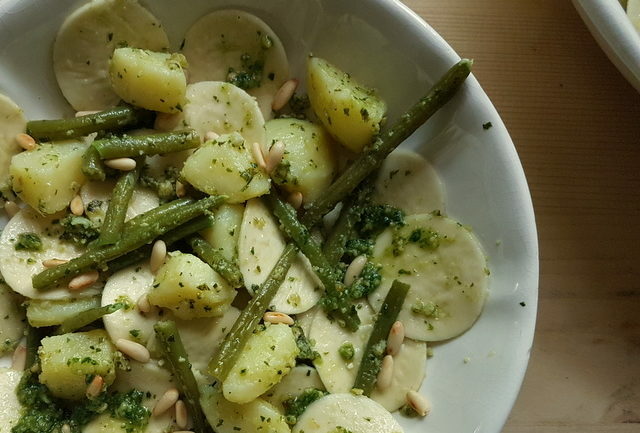 And, if you do try this pesto pasta Liguria with green beans and potatoes, please let me know what you think. 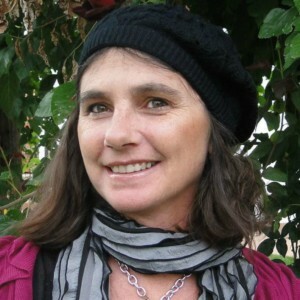 You can comment here on the blog or on The Pasta Project Facebook page. Looking forward to hearing from you! 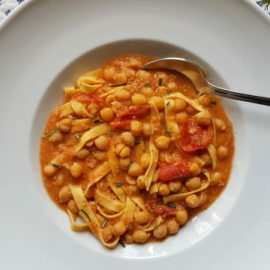 I wouldn’t tell anyone from Genoa that you used parmesan only if you don’t tell them that sometimes I have to replace the pine nuts with cashew nuts;) A tempting pasta dish and just the right kind for me, vegetarian. I’ve not used potato with pasta as yet…wonder why. Oh this had my tummy rumbling! I would love some of this right now! Oh my gosh that pasta is beautiful! I love all the veggies in this dish and that pesto looks delish! OMG that looks so delicious! I never thought potatoes and pesto would mix well. I’ll be sure to try it out next! Thank you for the post! Love the veggies in this dish, definitely worth a try. 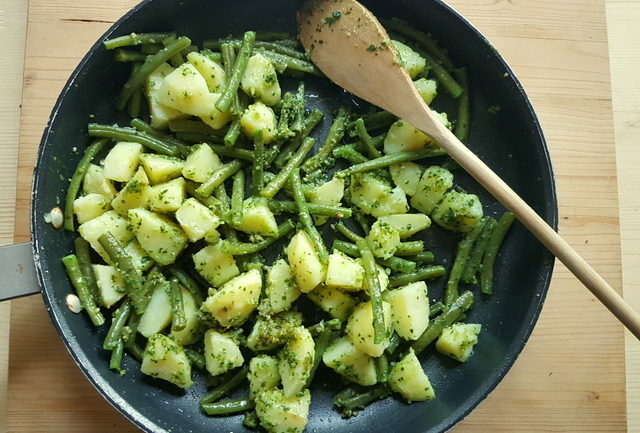 Green beans and potatoes are a great combination, thanks for sharing! Absolutely love this. It looks like my kind of food. I have not tried potatoes and green beans in my pasta yet but I sure will be experimenting now. You gave me a great idea for a recipe. I can’t wait to try it out. Thanks for the inspiration! Pasta and green beans is something I never tried before. But it sure looks appealing, and I will have to give it a try! Thanks for the recipe! I am not the biggest pesto fan but i will have to give this a shot! I have never had pesto quite like this before, but I love trying traditional preparations! Definitely adding this to the list of things to make soon! I love pasta! and I just wanna say this is perfect! This is so fun. I’ve never had pasta with potatoes. I’ve had gnocchi but never the pasta and the potatoes separate but in the same dish. I’m so curious I have to try this. I’ve never tried pasta that is combined with green beans before. However, this pasta looks awesome and I will definitely have to try this recipe! Wow! I am on a Keto diet right now but I think I am saving this for my cheat night which is coming very soon. This looks amazing and delicious!!! I have not tried Corzetti pasta, but I do, however, love Basil Pesto! For one I know that it’s made fresh and second, it goes well with chili flakes and shaved parmesan cheese. The potato is a good twist to this recipe. Can’t wait to try it at home. This looks absolutely amazing – I just think I found the perfect recipe for my dinner this weekend, thanks! I love this pasta! The fact that they sell the stamps is really fun! This pasta looks so delicious with the potato and green beans! I have to give this a try! I always make my own pesto these days, just so much fresher and tastier. Looks great with the beans and potatoes as well. Thank you Caroline! Homemade pesto is definitely the tastiest, and healthier too. It goes really well with potatoes and green beans. In fact, this is one of the most traditional ways to serve pesto with pasta in Liguria. Def one to try! All the best from Verona! Oh, this recipe is heaven on Earth. I definitely must make this – kids will be so happy. I’m not sure I’ll find the corzetti but will use trofies- I love the addition of potatoes. That makes it sooo extra yummy. I make a similar recipe with new potatoes but no pasta. Never thought of mixing potatoes with pasta. Will do from now. Divine! Thank you so much for sharing this delicious recipe. I grew up on pesto — my mamma would add it to potatoes and her grilled fish. I’m from the Trieste area. The recipe looks and sounds delicious. You can’t beat great ingredients and together they certainly add to the dish. The green bean addition to the potatoes really adds to the flavor and texture.